CalExpress provides comprehensive legal support services to law firms, attorneys, paralegals, businesses and individuals. Catering to our client’s specific needs and preferences has created a loyal, long-term customer base that depends upon our speed and reliability establishing CalExpress as the local leader in our industry. Our staff of Registered, Bonded Process Servers attempt and effect proper service of legal documents (on opposing counsel, businesses, registered agents, individual defendants and witnesses) day and night throughout Southern California. As a licensed private investigative firm, CalExpress can further assist the process with stakeouts on individuals and skip tracing. Skip Traces can be performed by searching people, assets, licenses, courts and business entities. 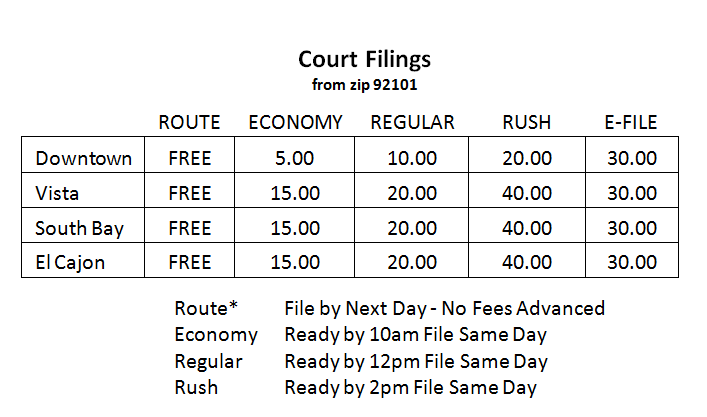 CalExpress performs filings at Superior & Federal Courthouses, County Recorder’s Offices, Secretary of State and other court jurisdictions nationwide. Documents from court case files can be copied and either delivered or scanned and emailed. Court per page copy fees and pro-rated hourly research charges apply.